The first season of Twin Peaks is almost perfect. The gist of the core plot is not unique to David Lynch’s soon-to-be revived brainchild, but he pulled it off better than anyone else. A local teenager’s grisly murder and the subsequent investigation take center stage, and the unraveling of that central mystery soon sweeps up the whole town. The seemingly idyllic town that gives the show its name is, surprise!, not the sleepy hamlet it may seem. Unnervingly dapper FBI agent Dale Cooper sifts through the fresh horrors stirred up by Laura Palmer’s death while a rich cast of supporting characters help him out, get in his way, or navigate their spooky town outside of Cooper’s orbit. Twin Peaks’ first season works so well because the show goes to such extremes when it both portrays the town’s endemic evil and paints saccharine portraits of small-town life in 1990s America. Lynch’s show is a loving paean to small towns and TV sitcoms, which makes his subversion of all their seemingly placid elements that much more disturbing. The line separating the two is paper-thin and liable to blur at any time. A tryst between high school lovers might get interrupted by a murderous psychopath. A character’s independent investigation might lead to her almost being fed to her father, who runs a secret brothel over the Canadian border. The evil shown in the first season oscillates between a sketchily-defined cosmic rupture and a tightly plotted story of a police investigation, and Lynch never shows all his cards. It covers a lot of ground but does not meander. Lynch preceded Twin Peaks with 1986's Blue Velvet, which is perhaps the best film of the 1980's and resembles Twin Peaks on several fronts. A puppy dog-perfect Kyle MacLachlan stars as a college student who returns home to his idyllic small-town home and falls for a mysterious woman being lorded over by a maniacal creep (played by Dennis Hopper, who puts forth one of the scariest performances I have ever seen). Laura Dern plays interlocutor and audience surrogate, as Lynch plumbs the same thematic depths that he returns to with Twin Peaks: the hidden savagery at the heart of supposedly placid American life. No mater how calm things seem, no matter how cleanly the lawns are mowed, violence and perversion are woven into the fabric. MacLachlan’s all-American steadiness drives both projects. Blue Velvet works in part because the boyish, innocent-looking MacLachlan (who had just starred in Lynch’s Dune, a legendary flop, as a 25-year-old unknown) is a peerless representative of the sort of Americana that Lynch seeks to simultaneously skewer and praise. His character in Blue Velvet is an innocent college kid who is nonetheless curious about the kinkier, darker side of town. Dale Cooper is almost a progression of that character. He has seen the lurking menace at the heart of the American experience, and he’s on a crusade to eradicate it wherever it pops up. Given the thematic heft of the show, it could easily lurch into soap opera nonsense, but Cooper is utterly unflappable and the town’s inhabitants are not written as clueless rubes, even if they are acutely dramatic people. Twin Peaks plays it all straight, which makes it all the more unsettling. As someone who wasn’t born when the series ended and only came across it after the whole thing had been turned into one big meme, I was struck more than anything by the uneasiness of the world. The coffee habit that launched a thousand tote bags is there, and, yeah, the red room scene is deservedly iconic, but the show isn’t a campy send-up of the American television show. Its subversion comes from its unrelenting weirdness and obtuse horror. Lynch’s camera fixates on screaming mouths and spinning sawblades, picking away at the fabric of the town as it shows it to you. Then it turns into a big mess. The tightly-knotted yarn of Season 1 unravels the moment Season 2 starts. Instead of a resolution to the season-ending cliffhanger where Cooper gets shot in his room, viewers get their heads dunked into a big bucket of cold water and are forced to watch Cooper lie on the floor bleeding and rambling. A geriatric waiter enters the room and instead of helping, he just sort of bleats at the camera. It’s a grating and abrupt capsule of the entire season in miniature: a once mysterious and claustrophobic show has bloated out and glazed over. Yet it still works. The consensus is correct; Season 2 is the inferior season. The majority of its episodes are worth a damn, though, and things don’t truly go off the rails until the home stretch. The show’s second batch of episodes reach higher highs than those in the first season, and ambition and restlessness serves the show well. The episode where the audience discovers who Laura’s true killer is features perhaps the most chilling single scene in the entire series. I am amazed that so many moments made their way onto television screens unedited, and nothing short of the finale is as chilling as watching the killer take his second victim while he garbles desperately at the camera. The schlock also gets dialed up to 11 in Season 2. The first season balanced its horrifying impulses and tendency towards grandiose sweetness well by playing them off each other and never going too far in either direction. By the time Episode 9 rolls around, the show has abandoned any restraint. Season 2 isn’t anything like the evenly-tempered pilot episode (for my money, the best pilot ever put to wax) and it goes way too far in every direction as David Lynch and co-creator Mark Frost became less involved with writing and directing as they pursued other projects. One of the James-centric subplots is pure soap opera trash; a core character has a breakdown and lives out an extended fantasy that he’s a general in an alternate universe Civil War where the South won; there is perhaps the schlockiest scene in TV history. If you dig the atmospherics of Season 1 and enjoy the moments where the shows fully indulges in its own whimsy, you’ll like the bulk of Season 2. It’s the apotheosis of everything that made Twin Peaks unique, for better and for worse. I can’t defend the back third of the season, where a ratings nosedive caused producers to flail at all manner of rotten and nonsensical plotlines. There’s nothing good about Audrey’s sudden fling-ette with a dapper cowboy guy from out of town or the ham-handed way the entire Windom Earle plot is carried out. It’s a big dumb mess and there’s little to enjoy. However, the show did not end with a whimper. 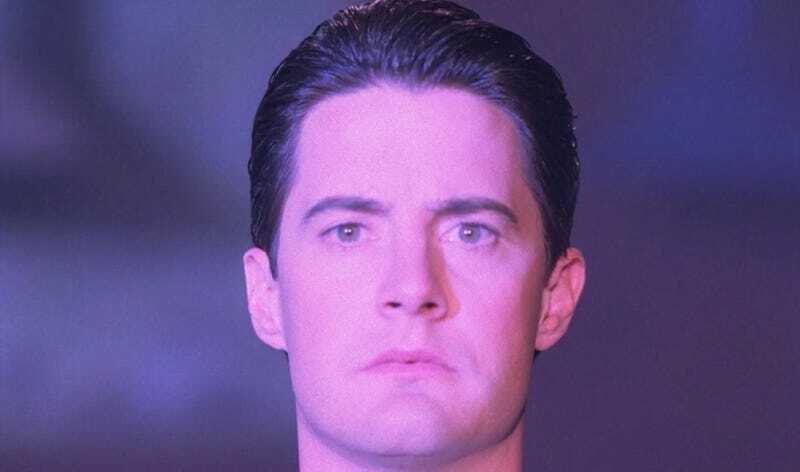 The hallucinogenic finale, where Cooper enters the Black Lodge and seeks to confront BOB and Earle in an interdimensional M.C. Escher nightmare world, does not hold back. Cooper plunges deeper into new layers of a funhouse-mirror infested chamber, unsheathing new horrors at every turn. A malevolent spirit devours his rival as doppelgängers wail and shriek. The grotesquerie of the Black Lodge is relentless and nigh-inscrutable, as if Lynch (who took charge of much of the episode personally) wanted to pull back the curtain once and for all, exposing the supernatural rot and savagery at the heart of Twin Peaks. Lynch briefly returned to the town of Twin Peaks for the 1992 prequel Fire Walk With Me. At this point, the humor and spirit that animated the show was gone and all that was left was the repulsive side of things. The movie tells the story of Laura Palmer’s last days on Earth. MacLachlan is briefly present, but the film spends most of its time digging into the grittier stones that Twin Peaks turned over. One could make the case for Fire Walk With Me as a fittingly unflinching meditation on abuse, but as for the town of Twin Peaks, the mask had come all the way off and the product Lynch put forth was gross and listless. Twin Peaks makes its prophesied return this Sunday after 26 years off the air. Lynch is directing all 18 episodes and not even the unbelievably deep roster of actors who comprise the new cast really know what to expect. Uneven as it was, Twin Peaks crafted a cohesive world that warrants revisiting. Even though the show lost its way for a bit there at the end, you can trust that David Lynch’s new vision for this story will be just as unsettling and sublime. It never made sense, and it never needed to. That won’t change now. Laura Palmer promised Cooper in a dream that she’d see him in 25 years, and if you count Fire Walk With Me (count Fire Walk With Me), that’s just as long as it’s been since Lynch showed us Twin Peaks. Kyle MacLachlan is no longer a pretty boy on the cusp of superstardom; he’s a successful veteran with a winery and 86 episodes of work on Desperate Housewives. This Dale Cooper will be far different than the dapper mannequin who chomped chocolate bunnies outside the Roadhouse. He’s changed. Lynch has changed. Twin Peaks hasn’t.